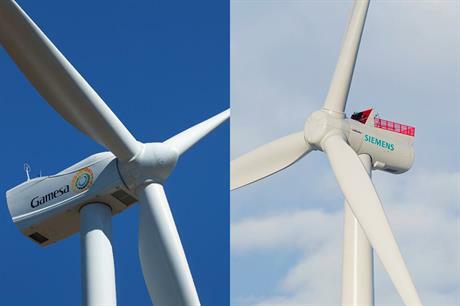 GERMANY/SPAIN: Siemens has signed a binding agreement with Gamesa to merge the two companies' wind businesses, creating an OEM with a 69GW installed base worldwide. Today's announcement comes after months of negotiations. Siemens said it would hold a 59% stake in the resulting merged company, with Gamesa owning the remaining 41%. Gamesa CEO Ignacio Martin said the merger is subject to shareholder and regulatory approvals but is expected to close by the end of Q1 2017. Spanish utility-developer and major Gamesa shareholder Ibedrola is "very supportive of the proposed transaction", according to Martin. Iberdrola will retain an 8% stake in the new company. The new company will have its legal domicile and global headquarters in Spain. The onshore business will operate out of Spain, while the offshore business will remain at Siemens' bases in Germany and Denmark. Gamesa shareholders will receive a cash payment of €3.75 per share paid by Siemens, a total of €1.05 billion, the firm added. Gamesa said the new company is expected to have a 69GW installed base worldwide, an order backlog of around €20 billion, revenue of €9.3 billion and an adjusted EBIT of €839 million. "Today, we are embarking on a new era, creating, alongside Siemens, a world-leading wind player. We will continue to work as before, albeit as part of a stronger company and with an enhanced ability to offer all of our customers end-to-end solutions," said Martin. Siemens CEO Joe Kaeser added: "The combination of our wind business with Gamesa follows a clear and compelling industrial logic in an attractive growth industry, in which scale is a key to making renewable energy more cost-effective." "[This is the] best possible strategic fir in the wind power industry," Kaeser told reporters. Meanwhile, Gamesa has reached a deal with French firm Areva over the future of its offshore joint venture, Adwen. "Gamesa and Areva have entered into contractual agreements whereby Areva waives existing contractual restrictions in Gamesa’s and Areva’s offshore wind joint venture Adwen, simplifying the merger between Gamesa and Siemens," Gamesa said. "As part of these agreements, Gamesa — in alignment with Siemens — grants Areva a put option for Areva’s 50% stake and a call option for Gamesa’s 50% stake in Adwen. Both options expire in three months. "Alternatively, Areva can in this time divest 100% of Adwen to a third party via a drag-along right for Gamesa’s stake," the Spanish manufacturer said. Earlier today, Gamesa confirmed to Spain's financial regulator it has obtained the "relevant corporate permits" to proceed with a reported $1 billion merger with Siemens' wind business. Gamesa suspended trading on the Madrid stock exchange after publishing the notice. Any merger of the wind businesses would create the world's largest turbine OEM, with a predicted market share of 14-15%. Siemens and Gamesa were, respectively, the fourth and fifth largest manufacturers in 2015, according to FTI Consulting and Bloomberg New Energy Finance figures. The Bloomberg news agency reported Siemens could pay $1 billion for Gamesa, citing unnamed sources "familiar" with negotiations. A move of this kind benefits both companies. Siemens is the world's largest offshore turbine supplier but has fewer sales onshore, and has struggled with breaking in to markets outside Europe and North America. Gamesa, on the other hand, is reliant on emerging markets, such as Latin America, China, and India, something Siemens would be looking to benefit from. Adwen has so far struggled to make much impact in its first year of operations. It has a pipeline of around 150MW in France and its turbines are currently being installed at the 350MW Wikinger project off Germany. The fate of Adwen is still unclear. Areva has three months to decide whether to sell its share to Gamesa (and Siemens) or to a third party. There have been rumours GE would be looking to take on the business at it looks to grow its European market share, following its takeover of Alstom's power business in November. In an interview with French newspaper Le Figaro this week, GE chief executive Jeff Immelt said: "Being bigger would be better for us. Talks are under way with different parties: Siemens, Areva, Gamesa, us and the French state." However, at AWEA Windpower 2016 in New Orleans at the end of May, GE's head of renewables, Jerome Pecresse said: "We are not engaged in deep discussions with anybody." A GE Renewables spokeswoman today told Windpower Monthly the company had been in discussions over a possible Adwen-takeover, although she was unable to say who else had been at the table. However, the spokeswoman stressed there are "no definitive plans at this time", although the company is looking to grow in the offshore business, possibly through "strategic acquisitions". As for Areva, the Wall Street Journal reported: "Areva on Wednesday separately announced plans to split the state-controlled nuclear-engineering group in three as part of a restructuring plan to raise as much as €8 billion ($8.97 billion). Chief financial officer Stephane Lhopiteau, on a conference call with reporters, said Areva plans to sell its renewable-energy assets gradually."